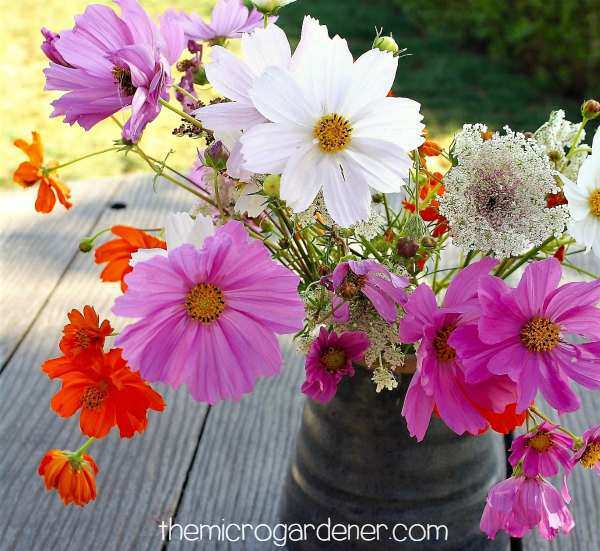 Cosmos flowers (Cosmos bipinnatus or Mexican aster) are showy annual flowers that offer you SO many benefits. If you’ve never grown these ornamental beauties, you may be surprised how useful these cheerful flowers can be. Cosmos is a member of the Compositae or Asteraceae family, just like their ‘cousins’: sunflowers, marigolds, yarrow, daisies, zinnias, lettuce and dandelions. These easy care flowers are perfect for a full sun position in your garden or a pot, growing through spring to autumn. Not surprisingly, the name Cosmos comes from the Greek word ‘kosmos’ which means ‘beautiful’. Aww! These flowers come in many colours and grow tall with attractive feathery leaves. I encourage you to find a pot or tiny space to sow a few seeds. So why grow these beautiful blooms? Their open flowers provide easy access to nectar and pollen. You can never have enough pollinators and predator insects in your garden, helping pollinate and pest manage for you. 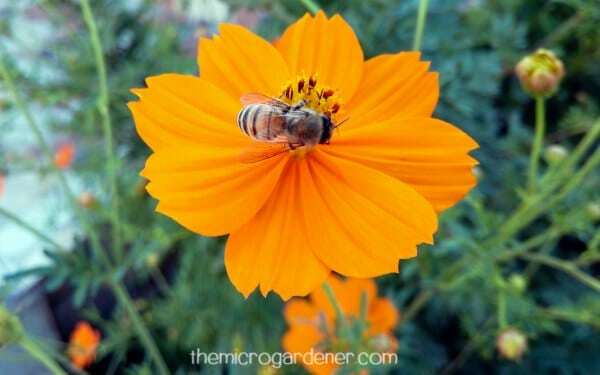 Cosmos flowers are magnets for beneficial insects like lacewings, parasitic wasps, tachinid flies and hoverflies that feed on many pest insects and provide free pollination services. Even in tough, hot or dry conditions with little water. They seem to flower best in poor soils with less organic matter which encourages lots of leaves at the expense of blooms. They are often seen growing along the road side in full sun, with no fertilizer in the soil and surviving on rain and dew. Perfect if you have a difficult climate! If you want to save seeds, you need to choose cosmos varieties that have been open-pollinated rather than hybrids, and ideally organic. Why? This is important because otherwise they won’t grow ‘true-to-type’, so it’s a lottery what variety you will grow. Non-organic seeds are commonly sprayed with harmful fungicides and other chemicals and seedlings bought from nurseries may contain neonicotinoids, toxic to bees and other insects. 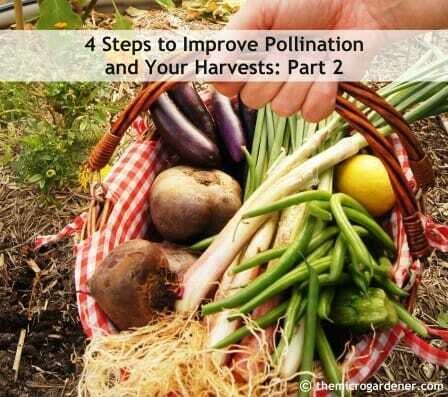 Learn how to grow a pollinator-friendly safe garden here. It’s easy to save seeds from your own garden. 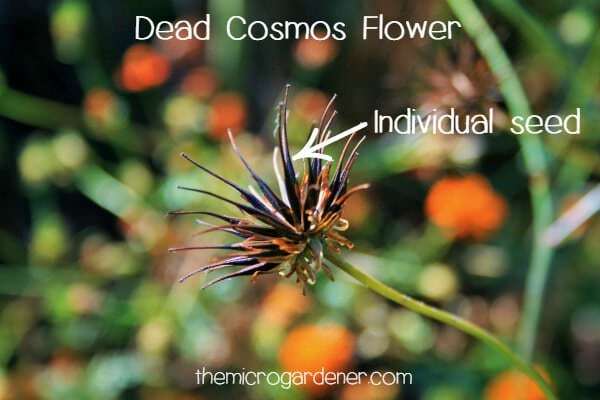 When the cosmos blooms die and go brown, snip off the flower head. Holding a bag underneath, gently rub and shake the seeds inside. Now you have a handful of cosmos seeds you can scatter around your garden again or save until next season. If you leave them in your garden, they will provide a free feed for your local birds. If you just allow your plants to die naturally, the dead flowers will fall to the soil. When the conditions are right, cosmos seeds will germinate all by themselves, saving you time seed raising. 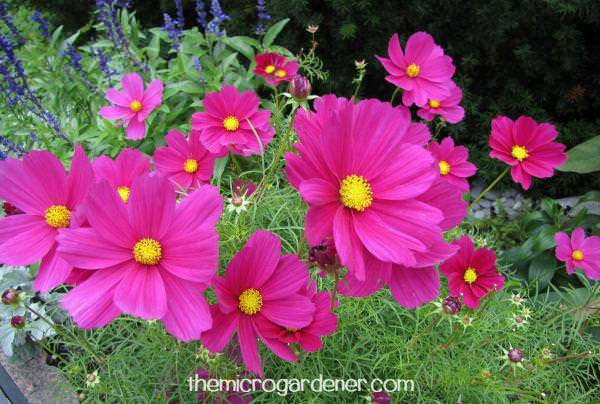 Cosmos blooms can last many months, so they’re great value. 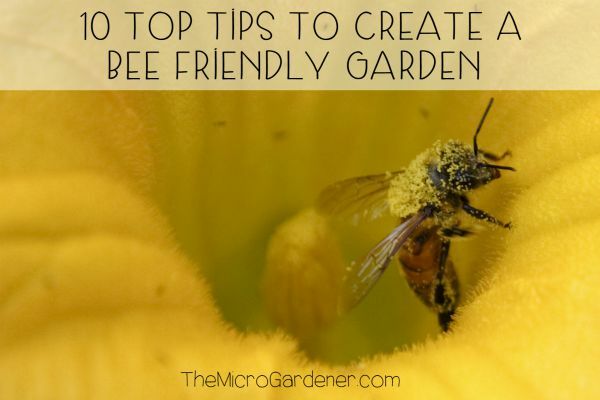 When planted in a group, they are an attractive focal point and will attract more bees than just dotted around your garden as single plants. These clever insects know they use less energy flying from flower to flower for a free feed, when they’re all in one spot. Smart hey? These flowers add beauty and colour to your garden, especially when planted en masse. 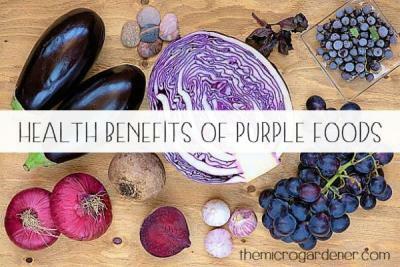 If you grow from organic seeds and don’t use chemicals, the pretty petals are also edible and brighten up salads. A low-maintenance flower without many pest problems is a bonus. Ideally, sow your cosmos in amongst other flowers like marigolds and nasturtiums, vegetables and flowering herbs. A diversely planted garden, even in a pot or tub will reduce the likelihood of an imbalance in pest insects. 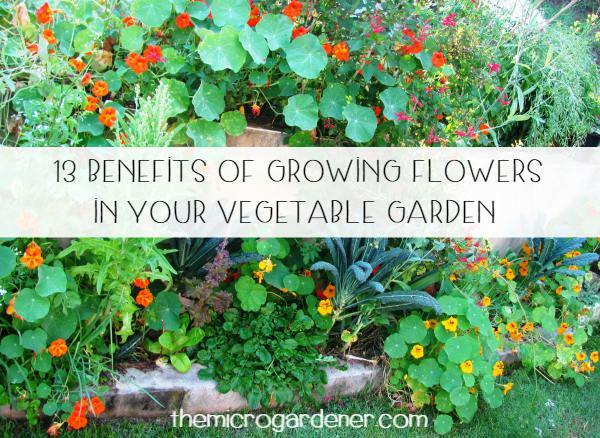 These flowers can last up to 7-10 days if you re-cut the stems regularly and keep in fresh water. Ideally cut your flowers in the early morning. This is when they contain the highest level of moisture, so are less likely to wilt. Choose blooms with petals that are just starting to unfold. The flowers will open fully once the stems are in water. Plunge immediately into a bucket of warm water. Strip off any leaves on the lower part of the stem that will be under the water. Decaying leaves will quickly rot and reduce the vase life of your beautiful blooms. Enjoy them in your home or grow a bunch for friends. Whilst cosmos seeds need water to germinate so seedlings establish, I’ve noticed they flower even without regular watering. Perfect if you’re a neglectful plant ‘parent’ or live in a climate with little rain! Plant in full sun in well drained soil. Mulch well and protect from strong winds. ‘Deadhead’ regularly if you have time. Just pinch off the dry dead flower heads that contain the seeds. This helps encourage new growth and more flowers. Keep them in a sealed airtight bag in a cool dark place so seeds store longer. 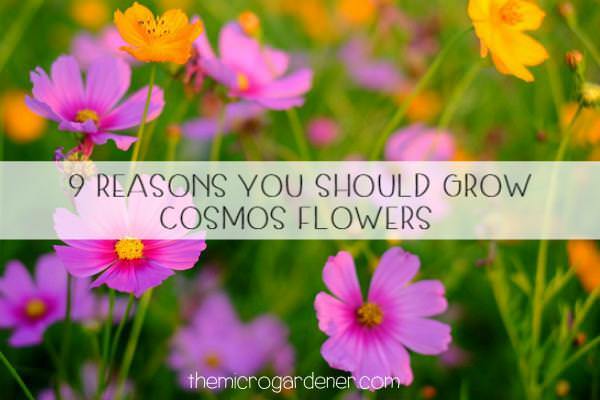 Depending on the variety and mature height of your cosmos flowers, they can grow quite tall. You may need to provide support stakes or sow beside a trellis or fence they can lean on. 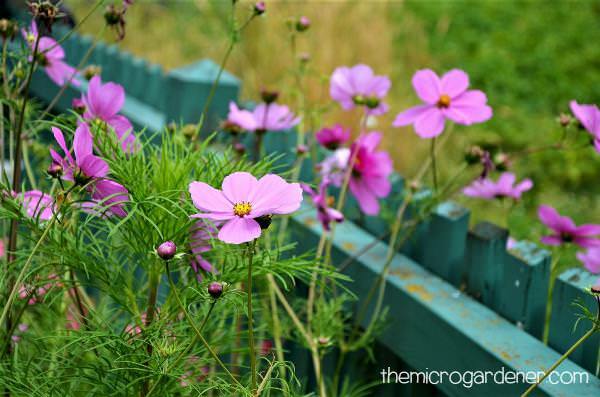 If you’re looking for a beautiful, low maintenance edible flower that attracts birds, butterflies and bees to your garden, with loads of benefits, try growing cosmos. I planted Cosmos seeds in small pots inside(to start them out) but packet does not say how often to water. Also, I live in Phx, AZ. Any special instructions for their health in ‘hell’? That’s how hot it can get here. I just love Cosmos! They grew so well in California… just add water. I figured Houston, TX, with it’s tropical climate might not work. But I’m gonna give them a try. And edible? After all these years loving this flower, I didn’t know it was edible either. Definitely gonna get some going in the Spring, here… Around the middle of January… LOL. Cosmos are a perfect choice for Texas. They thrive in hot dry conditions! Perhaps try growing some in a pot to get started. Remember to start with organic seeds if you’re going to include the petals on your plate and avoid using any chemicals. Thanks so much for the feedback Fran. I’m sure your grandmother (and lovely mum) would have allowed them to self sow. Much less work! As I mentioned in the article, I always start with organic seeds especially if planning to eat the flowers. It’s not just a matter of GROWING organically, but also the source of the seed. They come in some many delightful colours – I have yellow in my garden at the moment and they are just SO cheerful. I must take some pics of the petals in a salad. They look so pretty in a vase of mixed blooms and herb flowers too. I’ve been arranging them with pineapple sage red blooms, dill and parsley flowers as I already have so many seeds, heliconias and some other flowering perennials. 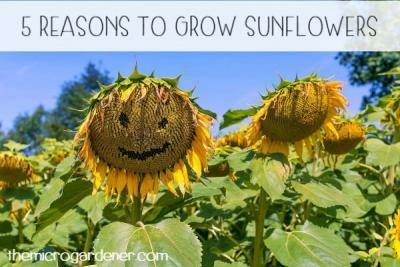 Like sunflowers, they just seem to make me smile!